Experience New Zealand fishing at its best with this 10 day adventure. Begin your adventure in the capital city of Wellington, before catching the ferry across the famous Cook Straight. Enjoy a full day fishing in the Tasman Bay with Nelson Fishing Charters, followed by a 3 hour cray and fishing charter in Kaikoura. Relax on a harbor nature cruise in Akaroa, before heading inland to Lake Tekapo and a spot of fly fishing. In Queenstown you will enjoy a cruise aboard the TSS Earnslaw to Walter Peak High Country Station, before enjoying a final day of fishing on Lake Wakatipu, with some of the best trout fishing in the region. 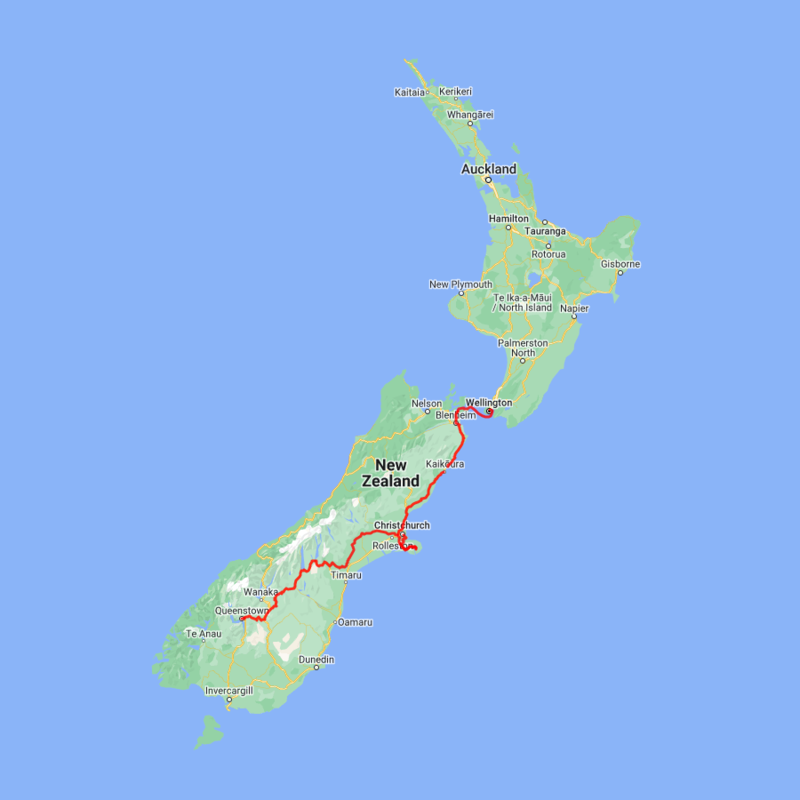 You can expect to spend around NZ$197 in fuel cost on this itinerary based on an intermediate sized car. Mapua Wharf was once a busy coastal freight wharf used for transporting fresh orchard produce to consumers around the world. It no longer bustles with wharfies and freight ships, instead there’s a steady hum of crafty creativity and the buzz of thriving restaurants, cafes and bars. Here you can watch a variety of local artists at work and purchase unique New Zealand creations direct. As well as the delicious fare available at the restaurants and cafes, you can also sample some divine artesian produce, like smoked mussels and salmon from the Smokehouse. To explore further afield hire a bike and explore the local bicycle trails, including the Tasman Great Taste Trail which links nearby Nelson with Mapua, via a ferry ride from Rabbit Island across the Waimea Estuary, home to a range of bird species. Mapua Wharf is a short 25 minute drive from Nelson. A day trip with Nelson fishing charters is one of the best fishing experiences you’ll do in the Tasman Bay, taking you to all the best fishing spots. Your guide’s local knowledge is programmed into the GPS charting system, helping you track down a variety of fish species. The abundant fishing is bested only by the breath taking scenery of this unspoilt natural paradise. Leaving from Nelson you will head out and fish around D'Uville Island. All baits and fishing gear is supplied, along with hot drinks so all you have to worry about is catching the fish. Then when you catch something, cook it up on the boat with the on board BBQ. Fish Kaikoura crayfish and fishing charter cater for the novice, through to the expert fisherman. Not only will you enjoy an unforgettable 3 hour fishing trip but you will also experience some of Kaikoura’s famous marine life including seals, albatross and dolphins as well as breath-taking mountain and sea views. Fish Kaikoura also guarantee a catch! Your vessel, the purpose built i-Catcher, ensures a comfortable and safe fishing experience, with enough space for 6 people to fish at once. The fish you catch will be cleaned and filleted as you go, so you will finish the day with fresh fish ready for your dinner. Provided: quality fishing gear, bait, gimbals and life jackets. The drive from Kaikoura to Christchurch continues to follow the spectacular coastline before heading inland and through North Canterbury’s major wine region, the Waipara Valley. You are also introduced you to the South Island’s most numerous inhabitant, the sheep. A great detour to take is the side trip to Hanmer Springs for a relaxing dip in the thermal pools. Arriving into Christchurch City puts you close to the airport and the International Antarctic Centre and a visit is highly recommended. Here you can get as close to experiencing life on the frozen continent without actually visiting plus see New Zealand little blue penguins and ride in a Haaglund Tracked vehicle. The Banks Peninsula offers a great contrast to the South Island's largest city. Just around a 1 1/2 hours drive from the city centre are rolling green hills, streams, golden sand beaches and small settlements that offer a unique insight into New Zealand's history and development. Just on the other side of the Port Hills is Lyttelton, a busy port town that was crucial to the development of Christchurch and the Canterbury Plains. Following the road around the beautiful natural harbour the names, such as Magazine Bay, Battery Point, Corsair Point and Governers Bay, remind of the importance the navy placed on this harbour. The Banks Peninsula itself is actually the remains of a long extinct volcano, the rim of which collapsed some time ago allowing the sea to flood into and create what is now the Akaroa Harbour. In 1840 French colonists settled in Akaroa in a bid to stake a claim for the South Island. Unbeknown the British had already declared sovereignty and a long drawn out dispute ensued with the British eventually being given government. However the French stayed and made this stunning part of the South Pacific their home and still to this day the town boasts French street names and every year a French Festival is held. The Harbour itself is teeming with wildlife and a nature cruise is a must do activity. One of the world's smallest and rarest dolphins, hectors dolphin, are often seen and cruises also offer excursions with the chance to swim amongst them. Lake Tekapo, in the heart of the Makenzie Country, is a very beautiful, turquoise coloured lake that provides good fishing for both brown and rainbow trout. It is the Northern most lake in the upper Waitaki basin and is mostly fed by snow melt, causing the light turquoise colour from the glacial silt. Lake Tekapo holds good numbers of trout and some reaching very impressive weights. There are a number of small creeks and rivers which generally flow clear providing excellent fishing at the point they enter the lake. For the shoreline angler, some of the best fishing is to be found around the mouths of these small streams. Most anglers however prefer to troll a lure from a boat. There is good access to the southern shore via State Highway 8. The Lilybank road provides good access at several points along the eastern shore and the Godley Peaks road provides access near Lake McGregor and towards the northern end of the lake. Lake Pukaki is just another 30 minutes drive from Lake Tekapo and as you approach the lake you are often rewarded with spectacular views the full length of the lake and into Mt. Cook National Park. At 3754 metres Aoraki Mt. Cook is New Zealand highest mountain and the peak can often be seen from the visitor centre at the southern end of Lake Pukaki. Twizel, just south of Mt. Cook was the location of many Lord of the Rings movie scenes and a little further on is Omarama, the gliding capital of New Zealand. Wrinkly Rams is a local cafe and also offers an informative sheep shearing demonstration. The Lindis Pass is one of New Zealand's highest roads with the summit reaching 971 metres. The tussock covered hills offer an unusual contrast as you pass from the Mackenzie Basin and into Central Otago. Bendigo, just off the main highway, was one of Otago's original gold mining settlements and well marked paths will guide you to explore the remains of stone cottages and other buildings from this bygone era. Cromwell sits at the head of the Kawarau Gorge. Cromwell old town has restored buildings from before the valley was flooded to create Lake Dunstan for the hydro systems. The sheer cliffs of the Kawarau Gorge guide you towards Queenstown and the Gibbston Valley is one of New Zealand's premier wine growing regions. At the famous historic Kawarau Bridge you can take a bungy jump or just watch others if you would rather. Approaching Queenstown the impressive Remarkables mountain range come into view and then beautiful Lake Wakatipu as you head towards the alpine resort town of Queenstown, the adventure and activity capital of New Zealand. The ultimate trout fishing experience. From beginners requiring tuition to the experienced fly fisherman. Spend 4-5 hours on the third largest lake in New Zealand being 80 km long and covering 293 square km. It averages 300m deep. A number of high country rivers and streams run into the lake making this an excellent fishery for Quinnat Salmon, Brown and Rainbow Trout. Aboard Kathleen II you can experience some of the best fishing in the Otago and Southland southern alpine lakes. The fully surveyed launch has resource management consent to operate on lakes Wakatipu, Wanaka and Hawea. The 6m/20ft Rayglass 620 Legend is powered by a 150HP Mercury Optimax outboard, Auxiliary 9.9HP Mercuary trolling motor plus a Mercury 50lb thrust electric motor for drift fly fishing.